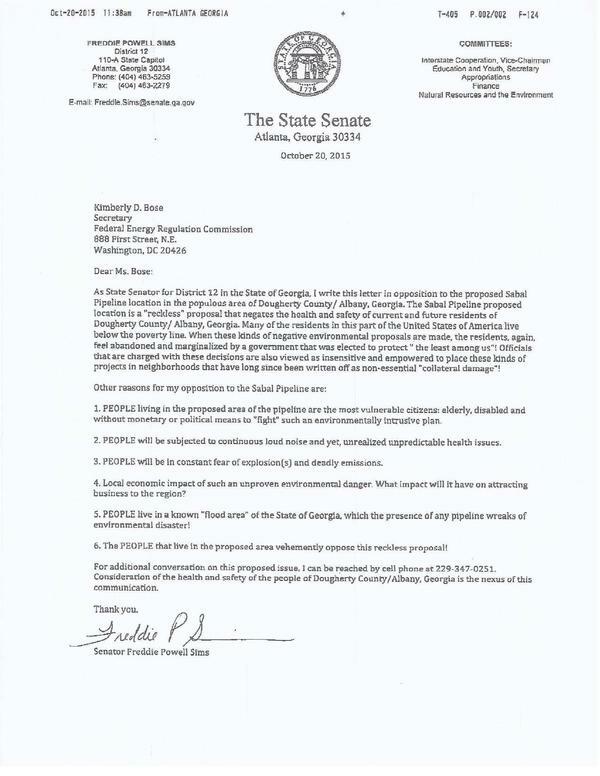 As State Senator for District 12 in the State of Georgia, I write this letter in opposition to the proposed Sabal Pipeline location in the populous area of Dougherty County / Albany, Georgia. 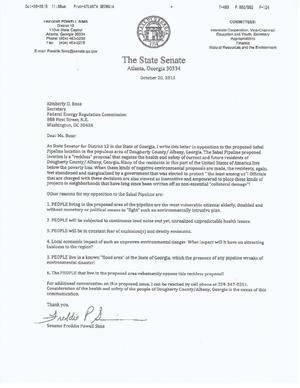 The Sabal Pipeline proposed location is a “reckless” proposal that negates the health and safety of current and future residents of Dougherty County / Albany, Georgia. Many of the residents in this part of the United States of America live below the poverty line. When these kinds of negative environmental proposals are made, the residents, again, feel abandoned and marginalized by a government that was elected to protect “the least among us”! Officials that are charged with these decisions are also viewed as insensitive and empowered to place these kinds of projects in neighborhoods that have long since been written off as non-essential “collateral damage”! PEOPLE will be subjected to continuous loud noise and yet, unrealized unpredictable health issues. PEOPLE will be in constant fear of explosion(s) and deadly emissions. Local economic impact of such an unproven environmental danger What impact will it have on attracting business to the region? PEOPLE live in a known “flood area” of the State of Georgia, which the presence of any pipeline wreaks of environrmental disaster! The PEOPLE that live in the proposed area vehemently oppose this reckless proposal! For additional conversation on this proposed issue, I can be reached by cell phone at 229-347-0251. Consideration ofthe health and safety of the people of Dougherty County/Albany, Georgia is the nexus of this communication. There’s more to do in WWALS v. Sabal Trail & FDEP. You can pick one or more of the above and help stop this un-needed, destructive, and hazardous fracked methane boondoggle!